Watersound Beach Vacation Rentals - Located in Northwest Florida, this beautiful beach front area offers stunning views and seclusion. With over a mile long strip of beach and coastal lakes this upscale area is sure to be a prime spot for your next Gulf Coast vacation. Choose from a variety of cottages, beach homes and condos on ECBYO and start planning your escape to the heart of Scenic Highway 30A's resort region. These properties offer swimming pools and many other endless amenities. With an outdoor recreational area filled with green wooded grasslands, community pools nearby champoinship golf and the endless emerald green waters of the gulf, WaterSound Beach is sure to be the perfect destination for your next family vacation. WaterSound Beach is surrounded by breath taking areas. 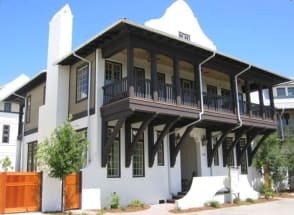 Take a short stroll or bike ride down to Seagrove Beach, Seacrest Beach or Rosemary Beach. Each area offers countless unique restaurants, shopping and scenery. 30A is home to many great stores and some of the most beautiful beaches on the Emerald Coast. You are sure to love your trip to Watersound Beach. Plan your next trip with Emerald Coast By Owner. ECBYO allows you direct contact with the property owner which assures you the best possible vacation experience. We hope you enjoy your trip to the Gulf!